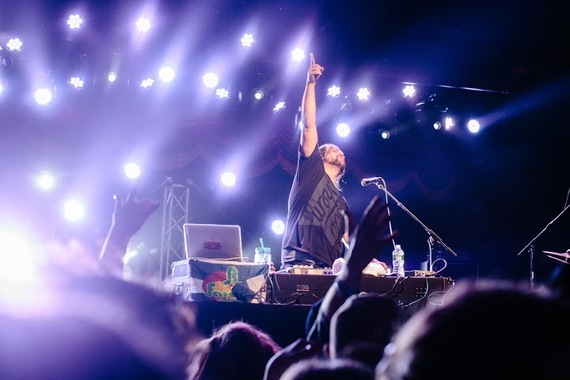 Musical alchemist, Michal Menert, has been reshaping the world of electronic music. No longer bound by the two genres of house and techno, this underground Renaissance is changing the way critics interpret electronic music. Where once it was vacuous, now there is depth. Layers of sound wash over us in a visceral gust of musical wind, moving us physically and emotionally. Hailing from Colorado, Michal Menert has been dubbed "the godfather of electro-soul," and aptly so. Bending genres and blending sensibilities, he has created a style that is unique, distinctive, and evocative. Michal Menert is set to release his third full-length album titled Space Jazz with Super Best Records on April 21, 2015. Growing up with Derek Vincent Smith of Pretty Lights, neither of them had any idea that their union would one day create a musical rebirth, an enlightenment of sorts. For decades, the purpose of dance music was similar to the purpose of the heart, to never stop pulsing. Now, dance music not only sustains the pulse like the heart, but also evokes emotion like the heart. Michal Menert is part of a community of DJs and producers who have turned electronic music into a truly respected art form. Menert's solo career has seen a meteoric rise in success, taking him around the world and back again. His name has been slowly moving up the music festival lineup hierarchy, starting at about a 9 point font and now reaching upwards of 16 point font and beyond! A delicious recipe of hip hop, soul, jazz, funk, afrobeat, blues and electronic music, Space Jazz has created an intergalactic cuisine, delectable to any sonic palate. At times, the album feels emotive and sway-worthy, moving through your body in waves. At other times, there is a strong hip hop sensibility where lyrical prowess travels through your synapses, awakening your mind. Peppered with trippy, drippy tracks that I cannot wait to hear on a professional sound system, I can already visualize a dancefloor full of gyrating bodies, spinning hula hoops and twirling fire toys. Two years in the making, Space Jazz will mark a new chapter in Michal Menert's already legendary novel. His smooth and seamless ability to fuse so many differing genres is a testament to his musical evolution. Spending so much time on this album, each sound, beat, lyric, and detail is intentional. Weaving instrumentals and vocals into his electro-soul creates a thick and hearty sound. A lot of electronic music is just broth, but Michal Menert's music is chowder. The union of vocals and instrumentation with electronic sounds is a poetic representation of our world today. We live in an era where the organic and inorganic are in constant flux. The inorganic constantly usurps the resources of the organic. We are organic beings that rely heavily on inorganic technology. In some cases, the inorganic overpowers the organic. Finding a balance between these two is evolution. In the electronic music world, the symbiosis of the organic and inorganic creates a sound that is connected, spiritual and exciting. Space Jazz is a synthesis of past, present, and future, elegantly woven together by the hands of Michal Menert.